I don’t have a preference for big pieces or small pieces when it comes to needlework. I enjoy them all, and have plenty of projects in all kinds of sizes and skills. I had purchased several smaller kits when I worked for House of Fabrics years ago and am now getting to finishing them. 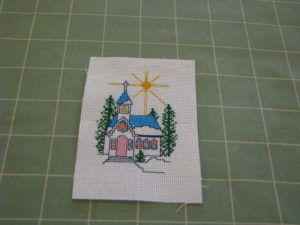 This was a quaint one-Church by Designs for the Needle. I have yet to make it into an ornament, but I’m not sure I’m going to. I may find something else to do with it. Church by Designs for the Needle.